Caricature portrait drawing is a distinct art form where artists sketch a person’s face in an exaggerated manner, most times to elicit humor. Automating this technique poses challenges due to the amount of intricate details and shapes involved and level of professional skills it takes to transform a person artistically from their real-life selves to a creatively exaggerated one. “Compared to traditional graphics-based methods which define hand-crafted rules, our novel approach leverages big data and machine learning to synthesize caricatures from thousands of examples drawn by professional artists,” says Kaidi Cao, lead author, who is currently a graduate student in computer science at Stanford University but conducted the work during his internship at Microsoft. 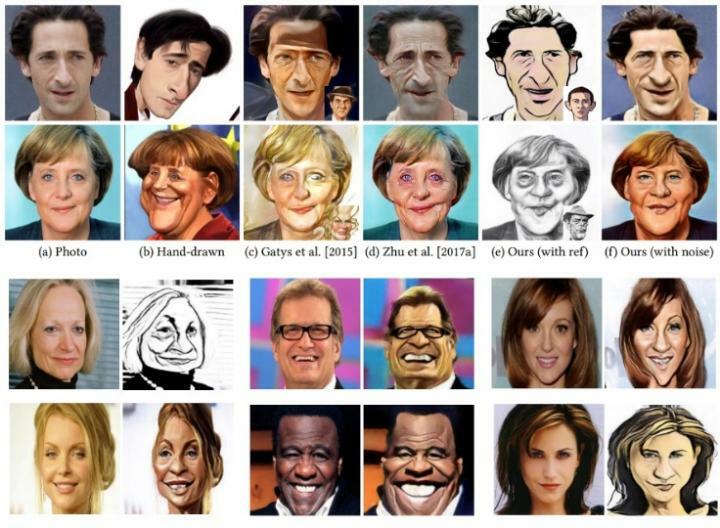 “While existing style transfer methods have focused mainly on appearance style, our technique achieves both geometric exaggeration and appearance stylization involved in caricature drawing.” The method enables users to automate caricatures of portraits, and can be applied to tasks such as creating caricatured avatars for social media, and designing cartoon characters. The technique also has potential applications in marketing, advertising and journalism. In this work, the researchers turned to a well-known technique in machine learning, Generative Adversarial Network (GAN), for unpaired photo-to-caricature translation to generate caricatures that preserve the identity of the portrait. Called “CariGANs”, the computational framework precisely models geometric exaggeration in photos (shapes of faces, specific angles) and appearance stylization (look, feel, pencil strokes, shadowing) via two algorithms the researchers have labeled, CariGeoGAN and CariStyGAN. Cao and collaborators conducted perceptual studies to evaluate their framework’s ability to generate caricatures of portraits that are easily recognizable and not overly distorted in shape and appearance style. For example, one study assessed how well the identity of an image is preserved using the CariGANs method in comparison to existing methods for translating caricature art. They demonstrated, through several examples, that existing methods resulted in unrecognizable caricature translation. Study participants found it too difficult to match the resulting caricatures with the original subjects because the end results were far too exaggerated or unclear. The researchers’ method successfully generated clearer, more accurate caricature depictions of portrait photos, as if they were hand drawn by a professional artist. Koelnmesse Pte Ltd is one of the world’s largest trade fair companies. Its more than 80 trade fairs and exhibitions have the broadest international scope in the industry, as 60 percent of the exhibitors and 40 percent of the visitors come from outside Germany. The Koelnmesse events include leading global trade fairs for 25 sectors, such as Imm Cologne, Anuga, IDS, INTERMOT, Interzum Cologne, Photokina, Gamescom, and the International Hardware Fair Cologne. Koelnmesse is ACM SIGGRAPH’s event organizer for the last 10 editions of SIGGRAPH Asia. For more information, please visit http://www.koelnmesse.com.sg.